How do I put an image texture on a material in Cycles? I am creating a model of a glass and I would like to put a drawing on it (a png picture). NOTE: UV Unwrapping a mesh and positioning the image properly can be a very complex and involved process. So, I highly recommend you study some UV Mapping tutorials to get all the details; YouTube has quite a lot of excellent video tutorials for beginners on this subject. Also, when you are watching video tutorials, notice how often the "Screencast" display down near the bottom of the 3D Viewport window -- it looks like a mouse outline in a grey window and it shows which mouse buttons and keys are being pressed so you can follow along what's happening better. UV unwrap your mesh. 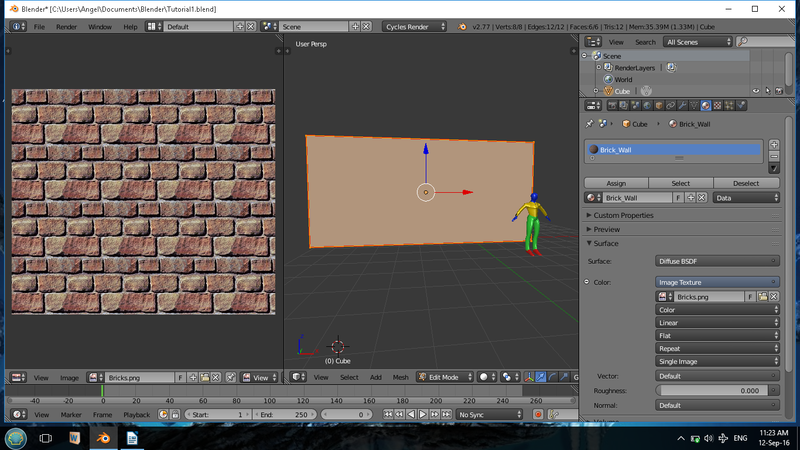 By default all textures in blender use UV maps. These must be generated by the user. For some quick UVs select the mesh and go into edit, select the entire mesh, U -> Smart UV project. If you do not want to use UV you can use other primitive UV projection types. Split the view panel so that you can see both the 3d view and the UV map. In the surface section, go to Color and click on the little circle on the far right (in the dark gray area). Select Image Texture, at this point a new item with an image icon will appear. Click on open and upload your image file. In the UV map view pane, you have the same image icon, click on it and select your image that by now should be listed there. Make sure your mouse is over the 3d view pane. 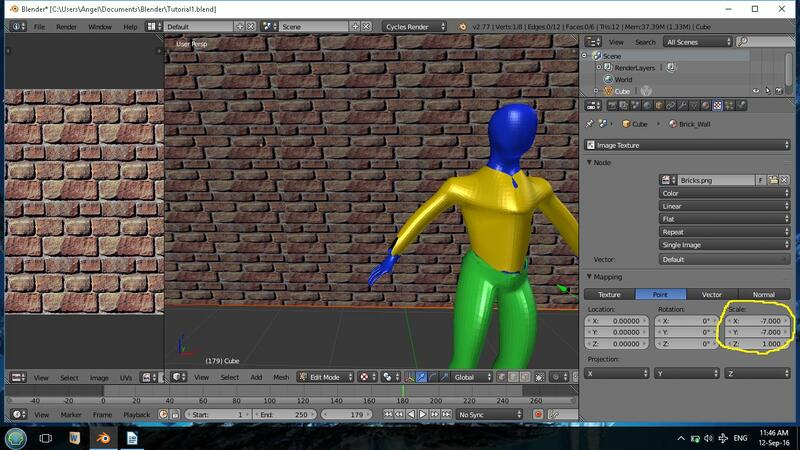 Select the object or the part of the object you want to apply the texture to, then make sure you are in Edit mode. With the mouse still on the 3d view, press U to unwrap your object; and select unwrap.You have two possibilities, UNWRAP and SMART UNWRAP, when you have marked the seam and for more complicated objects, UNWRAP is the best though you can use SMART UNWRAP for simple objects with little geometry. Now, you can see your UV map appearing on the top of the image texture. To see immediately how the texture would look like in render mode, Go to the 3d view and change the method to display from EDIT to TEXTURE. Click on the Texture button located on the right of the Material button. Your image texture should already be there in the Node section. Go down to the Mapping area, Point should be selected by default. Look at Location, Rotation and Scale. In our case, we are only interested in Scaling, however it is often necessary to rotate the image as well so in that case use Rotation. Scale the image by playing with the X and Y axes. You can see the result of your manipulation immediately in 3d view. In my case, I set the image to X-7 and Y-7. When you are satisfied with the quality of your image, remember to go back to Material and click Assign. Save your work and have fun!